Integrated Business Planning: Powering Agility in a Volatile World - E2open | Demand. Supply. Delivered. Economic, political and environmental challenges combined with the growing complexity of global operations have made Integrated Business Planning (IBP) a top corporate priority. In the most volatile business climates the potential is tremendous for this process that aligns sales, operations, finance and other functional areas of the organization into a single line of sight, from plan to performance to profit. 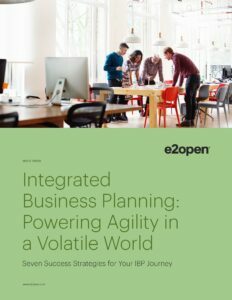 In this white paper, learn seven success strategies for your IBP journey.